During the presidency of George W. Bush, the United States embraced torture as an instrument of policy in clear violation of the Eighth Amendment prohibiting cruel and unusual punishment. Bush’s successor, Barack Obama, ordered the extrajudicial killing of an American citizen, a death by a drone that was visibly in disregard of the Fifth and Fourteenth Amendments. Both administrations — Bush’s with gusto, Obama’s with evident regret — imprisoned individuals for years on end without charge and without anything remotely approximating the “speedy and public trial, by an impartial jury” guaranteed by the Sixth Amendment. Should the present state of hostilities ever end, we can no doubt expect Guantánamo to become yet another source of “lessons learned” for future generations of rueful Americans. Indeed, when Obama in 2015 went so far as to ask Congress to pass a new AUMF addressing the specific threat posed by the Islamic State — that is, essentially rubberstamping the war he had already launched on his own in Syria and Iraq — the Republican leadership took no action. Looking forward to the day when Obama departs office, Senator Mitch McConnell with his trademark hypocrisy worried aloud that a new AUMF might constrain his successor. The next president will “have to clean up this mess, created by all of this passivity over the last eight years,” the majority leader remarked. In that regard, “an authorization to use military force that ties the president’s hands behind his back is not something I would want to do.” The proper role of Congress was to get out of the way and give this commander-in-chief carte blanche so that the next one would enjoy comparable unlimited prerogatives. Collaborating with a president they roundly despise — implicitly concurring in Obama’s questionable claim that “existing statutes [already] provide me with the authority I need” to make war on ISIS — the GOP-controlled Congress thereby transformed the post-9/11 AUMF into what has now become, in effect, a writ of permanent and limitless armed conflict. In Iraq and Syria, for instance, what began as a limited but open-ended campaign of airstrikes authorized by President Obama in August 2014 has expanded to include an ever-larger contingent of U.S. trainers and advisers for the Iraqi military, special operations forces conducting raids in both Iraq and Syria, the first new all-U.S. forward fire base in Iraq, and at least 5,000 U.S. military personnel now on the ground, a number that continues to grow incrementally. 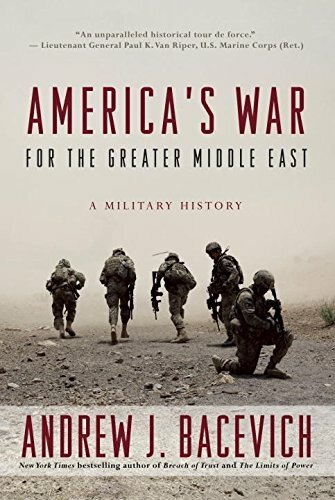 Andrew Bacevich, a TomDispatch regular, is the author of America’s War for the Greater Middle East: A Military History, which has just been published by Random House.